In recognition of his leadership in the fight for American independence, the Washington Monument was built to commemorate the 'Father of the Nation' and the first president of the United States, George Washington. 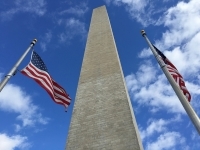 As the tallest structure in the city, situated at the western end of the Mall, the gleaming white obelisk offers 360-degree panoramic vistas with some of the most familiar sights in the world in view, including the White House, US Capitol, Smithsonian museums, and the Lincoln Memorial. Constructed out of loose granite blocks without the use of cement to hold them together, the monument is the tallest freestanding masonry structure in the world, a 555-foot (169m) marble obelisk that stood uncompleted for 37 years. A change in the colour of stone is visible about halfway up and marks the two building phases. In 1888 a steam elevator transported visitors to the top, a 20-minute ride that was restricted, for safety reasons, to men only. Women could walk up the 897 stairs. Today climbing the steps is prohibited, but a free elevator conveys visitors to the gallery that provides unparalleled views of Washington DC and across the Potomac River. Opening times: Open daily 9am-10pm. Admission: Although admission is free, a ticket is required to enter the monument and ascend to the top. Advance ticket reservations are subject to a small fee per booking.